Over the last 20 years, people have flocked from all over the world to Silicon Valley. It’s the epicenter of the tech boom, and a magnet that attracts talent, ideas, and capital to come together to create new things. Software mania has shifted the most important corporate addresses in the country from the streets of Manhattan to obscure towns like Mountain View, Cupertino, or Menlo Park. While a booming ecosystem has lured many to the Valley, it’s simultaneously unlocked new technologies that have made it possible to work, collaborate, and build new startups from anywhere. 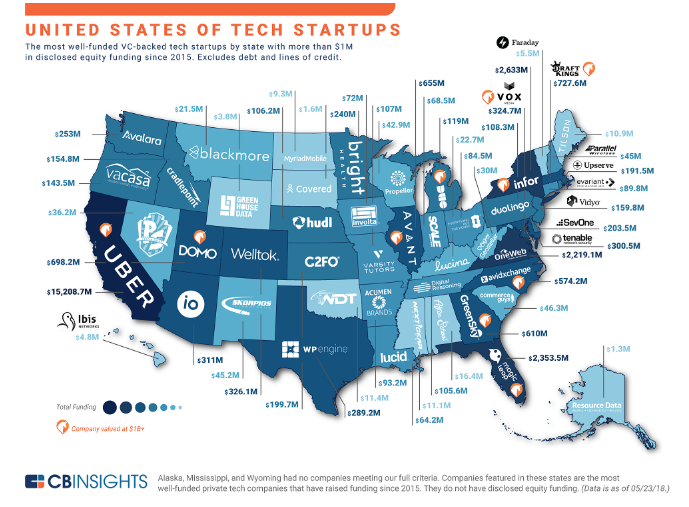 The result has been the birth of influential startups and ecosystems in every locale imaginable – and today, it’s true that nearly every state has an impressive tech startup to call its own.